Alison Lewis joined P.J. Morgan in 2015 with a background in construction, interior design and development. She also owns and operates Anchor Holdings, a local boutique building company with Tim Goodnight. A graduate of the University of Kansas, Ali went on to receive a second degree in Interior Design from the Fashion Institute of Design and Merchandising in Los Angeles. 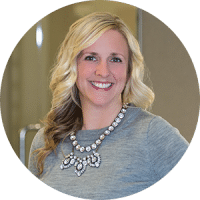 She returned to Omaha in 2004 to work on the Borsheims remodel; from there she built a career with Bluestone Development and went on to pursue commercial and residential design/build projects with established local clients, prior to starting Anchor Holdings with Tim in 2011. Anchor Holdings is the exclusive builder of P.J. Morgan Real Estate and is known for building design-forward custom homes with a strong emphasis on value.